Why Taking a Function Instead of Just Returning the Stream? The stack-walking API, released as part of Java 9, offers an efficient way to access the execution stack. (The execution stack represents the chain of method calls – it starts with the public static void main(String) method or the run method of a thread, contains a frame for each method that was called but did not yet return, and ends at the execution point of the StackWalker call.) In this article we will explore the different functionalities of the stack-walking API, followed by a look at its performance characteristics. This article requires working knowledge of Java, particularly lambda expressions and streams. There are situations when you need to know who called your method. For example, to do security checks or to identify the source of a resource leak. Every method call creates a frame on the stack and Java allows code to access the stack, so it can analyze it. Before Java 9, the way most people would access the stack information was via instantiating a Throwable and use it to get the stack trace. This works but it is quite costly and hacky. It captures all the frames – except the hidden ones – even if you need only the first 2 and does not give you access to the actual Class instance in which the method is declared. To get the class you need to extend SecurityManager that has a protected method getClassContext that will return an array of Class. To address those drawbacks Java 9 introduces the new stack-walking API (with JEP 259). We will now explore the different functionalities of the API followed by a look at its performance characteristics. Java 9 ships with a new type, the StackWalker, which gives access to the stack. We will now see how to get an instance and how to use it to execute a simple stack walk. The different calls allow you to specify one option or a set of them as well as the estimated size of the number of frames to capture – I will discuss both further below. Once you have your StackWalker you can access the stack information using the following methods. 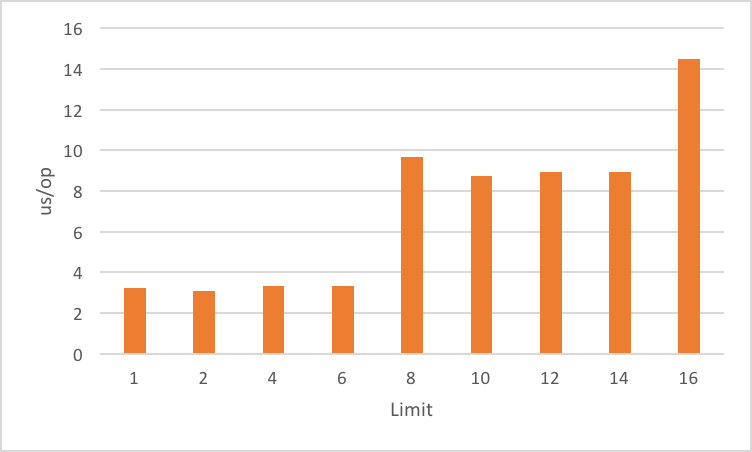 One of the big advantages of using the walk method is that because the stack-walking API lazily evaluates frames, the use of the limit operator actually reduces the number of frames that are recovered. The following code will retrieve the first two frames, which, as we will see later, is much cheaper than capturing the full stack. With the basics of how to get a stack walker and how use it to access the frames under our belt, it is time to turn to more advanced topics. When discussing the stack, it is easiest to imagine it as a stable data structure that the JVM only mutates at the top, either adding or removing individual frames when methods are entered or exited. This is not entirely true, though. Instead, you should think of the stack as something that the VM can restructure anytime (including in the middle of your code being executed) to improve performance. If you try to leak the stream by passing an identity function it will throw an IllegalStateException once you try to process it. To make the common case fast and simple, the StackWalker provides an optimized way to get the caller class. Bytecode index: the index of the current bytecode instruction relative to the start of the method. Class name: the name of the class declaring the called method. Method name: the name of the called method. Is native: whether the method is native. It also gives lazy access to file name and line number but this will create a StackTraceElement to which it will delegate the call. 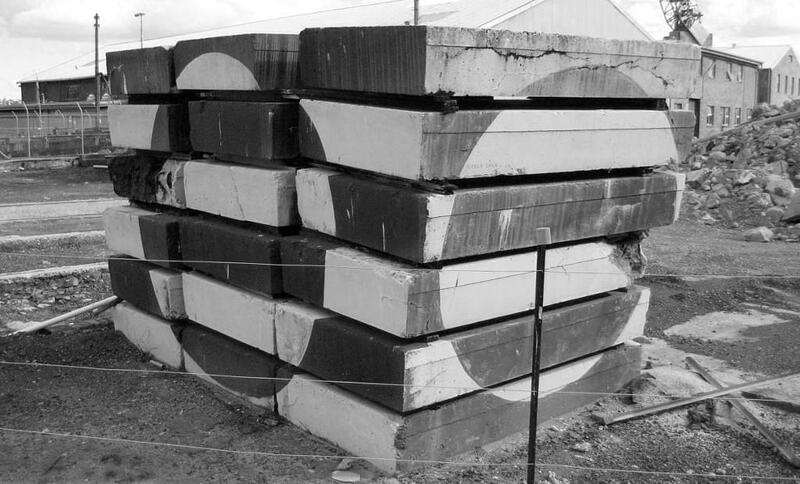 The creation of the StackTraceElement is costly and deferred until it is needed for the first time. The toString method also delegates to StackTraceElement. Now that we walk the walk lets have a look at the impact of the different StackWalker options. Because some of them handle frames with special properties, a normal call hierarchy does not suffice to demonstrate them all. We will hence have to do something more fancy, in this case use reflection to create a more complex stack. The Runnable task will be a lambda printing the stack using the StackWalker::forEach. The execution stack then contains the reflective code of delegateViaReflection and a hidden frame associated with the lambda expression. By default the stack walker will skip hidden and reflective frames. You will need to add the RETAIN_CLASS_REFERENCE option to gain access to it. A main reason for the new API was to improve performance, so it makes sense to have a look and benchmark it. 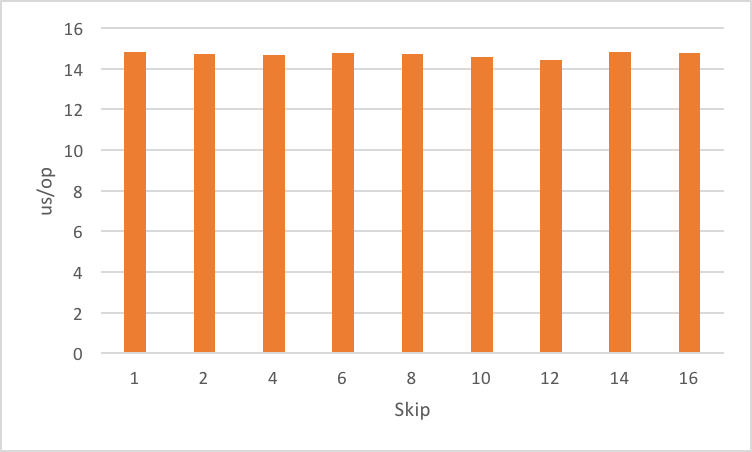 The following benchmarks were created with JMH, the Java Microbenchmarking Harness, which is a great tool to test small snippets of code without unrelated compiler optimizations (dead code elimination for example) skewing the numbers. Check out the GitHub repository for the code and instructions on how to run it. In this benchmark we compare the performance of getting the stack via a Throwable and via the StackWalker. To make it a fair fight, we use StackWalker::forEach, thus forcing the creation of all frames (because using Throwable does the same thing). For the new API we also distinguish between operating on StackFrame vs creating the more expensive StackTraceElement. 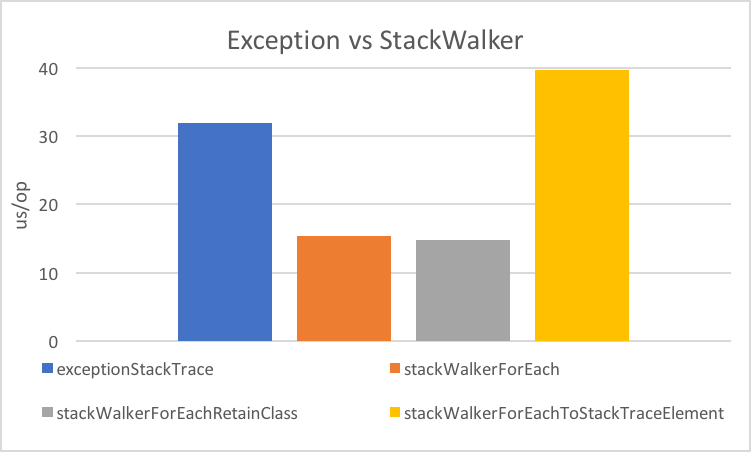 StackWalker is faster than the exception as long as you don’t instantiate the StackTraceElement. Instantiating a StackTraceElement is quite expensive, so beware of getFileName, getLineNumber and toString. Getting access to the declaring class has no cost, it is just an access check. The StackWalker is already faster when capturing the full stack, but what if we retrieve only part of the stack frames? We would expect the lazy evaluation of frames to further increase performance. To explore that we use StackWalker::walk and Stream::limit on the stream it hands us. 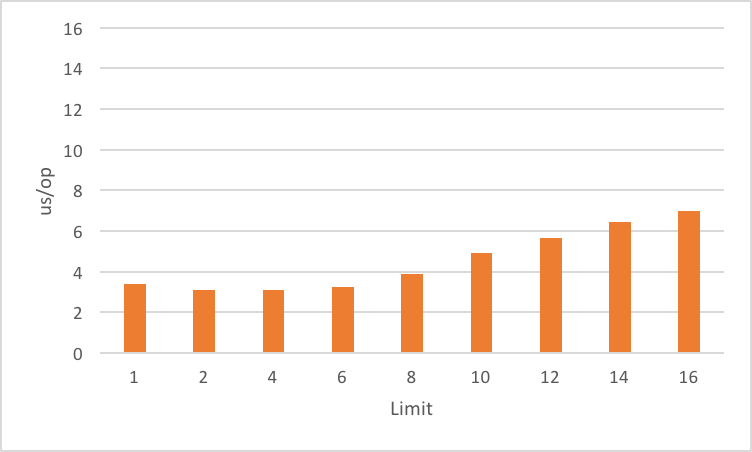 It appears that there is a threshold effect where the cost increases at 8 and 16. If you look at how the walkis implemented, it is no surprise. The StackWalker fetches the frames with an initial batch of 8 if the estimated size is not specified and will fetch another batch once all the frames are consumed. As you would expect the StackWalker still has to walk past the skipped frames resulting in no benefits. A relatively old software developer who worked in many industries - finance, media, security -, with a particular interest in Java, the JVM and performance. He likes to play with byte-code generation and indulges in looking at the ASM generated by hotspot. Lives in Belfast, Northen Ireland.